The Bag Dump Station is typically used to empty small bags of bulk solid material, such as a wide variety of powders, into a bulk material handling and processing system. The bulk bag dump station is used in a wide variety of industries and applications. The basic unit usually consists of a hopper, hinged lid, outlet cone, bag support shelf, and grate. The Sterling Systems & Controls’ bag dump station is custom designed to meet the exact requirements of our customers’ process, often including dust collection to control the spread of dust during the dumping process. Bags are lifted up and set on the grate where they are then opened and the material emptied into the hopper. The grate helps to keep the bag or parts of it from falling into the hopper. Dust collection is such that a downward airflow is pulled below the grate, pulling the dust away from the operator. Materials of construction can be mild or stainless steel. A common use and application combines Sterling Systems’ semi-automatic hand-prompt batching systems with a bag dump station to introduce the collected batch into a conveying system for transport downstream for further processing. In this example shown here a pneumatic conveying system is used to move the collected batches downstream. A blower system located beneath the hopper creates the pneumatic pressure to convey the batch bulk material. Sterling Systems & Controls semi-automatic batching system ensures that the batches are manufactured to the formula criteria, while also validating and documenting the process with excellent reporting capabilities. The results are the production of consistent, quality product with increased production and batch accountability (i.e. amount weighed, batch number, ingredient lot numbers, start/finish times, operator management, time/date stamp, etc.). The weigh batching control panel incorporates an embedded industrial PC and a large touchscreen display for the operator interface. The combination provides a rugged & cost effective platform for a demanding factory environment. The system provides for a single lighted push-button, which will protect the touchscreen element from excessive wear & tear. In order to provide protection against cleaning, the enclosure water resistant. The control system is built to NEC specifications and is UL Listed. To help save installation time and maintenance costs, the system is pre-wired to color-coded terminal strips with each wire numbered at both ends. The control system will prompt the operator, via the touchscreen, through the chosen formula one ingredient at a time ensuring that the correct material is being used. 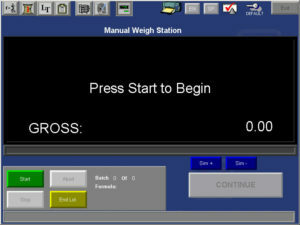 The required ingredient is displayed for the operator, the operator enters the ingredient details or scans the product, and if the correct ingredient is entered the system will then display the required weight. 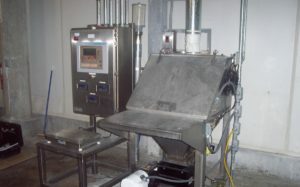 Once the weighment is within a programmable tolerance the System will ask the operator to acknowledge that this ingredient addition is finished the it is acceptable to move on to the next ingredient. 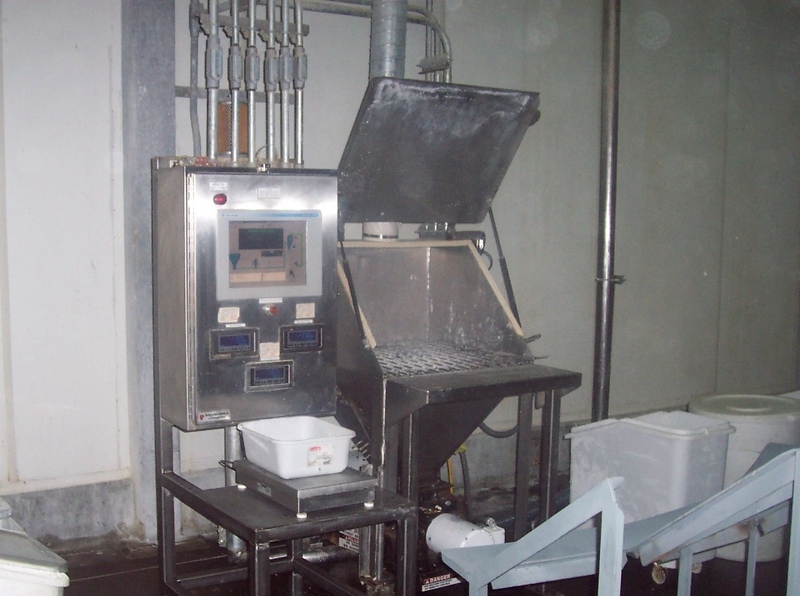 Once the operator acknowledges, the System will continue to the next ingredient, once again if it is within tolerance the system will prompt the operator to continue on to the next ingredient until the batch is complete. After a batch is complete, the System can print a batch summary with individual ingredient information that will include the ingredient number, name, required weight, actual weight, and lot information. The System software will also allow the scheduler to assign a lot number to each batch so that the batches may be searched by the lot number. A “move ticket” can be printed and attached to the container for identification and tracking in further processing of the batch.